All “Ask Jason”/Shark Tank is back! 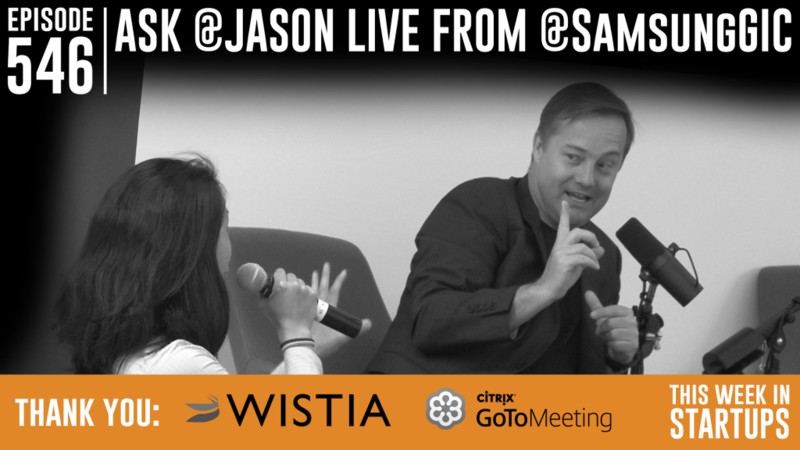 Today’s show, hosted at the Samsung Global Innovation Center, features companies asking for Jason’s honest advice on their fledging startups, and entrepreneurs asking Jason their most burning questions. And the ideas sparkle & fly! We meet a music event startup, a virtual reality startup, a live video journalism app (reverse Periscope), an on-demand personal assistant app, an idea network, and more. Jason covers the importance of conducting user interviews, the importance of solving a singular problem really well, why the metaverse (a 3D version of the web) will not be productized, how working on virtual reality now feels like working on the internet right before broadband (a 5-10 year journey), why crowdsourcing live video for journalism is a GREAT idea, how it can be better to focus on getting one high-profile partnership than growing organically, the main criterion for Jason typically to invest (contrary to most investors! ), execution > money, the huge advantage of working in a wide open space — and so much more!